It's Spring Break 2013! I have an entire week off from school! So what am I doing? Am I at the beach with my friends? Am I up all night drinking and partying? Yeahno. I'm in Orlando with my family. ...just so we're clear, I think this is infinitely better than being at the beach or partying excessively. Technically yesterday was the first day of my break, but I didn't really do much. My family and I drove for six hours, explored our resort, and ate dinner. That's boring. You don't want to hear about that. 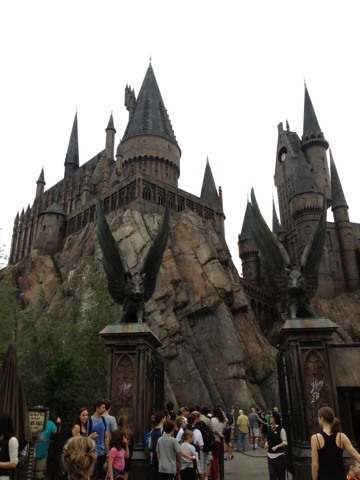 ...they built the Wizarding World of Harry Potter. We grumbled. We complained. And then we forked over our money and our dignity and went to the park. Frankly, it was more than I had hoped for. That entire section of the park is fantastic. Hogwarts is amazing. The Harry Potter and the Forbidden Journey ride is housed inside the castle, and you get to walk through it while you wait in line for hours on end. They've detailed the inside of the castle to perfection and they've even got video clips of the real actors in the ride and the staging areas. I did a nerdy little dance each time we walked past something awesome like the house points hourglasses or the entrance to Dumbledore's office. The ride itself was fun, too. I'm very impressed with the effort they put into it. The rest of that section of the park is comprised of Hogsmeade, the village that Harry visits during the school year. They have every type of Harry Potter merchandise you can think of. I bought a Ravenclaw scarf and a postcard- and then a witch outside the shop postmarked it for me. It reads "Hogsmeade: Owl Post." They also have Zonko's Joke Shop and Honeydukes, which smells like sugar and delicious things. The line of Honeydukes candy is very impressive. I saw just about every type of candy mentioned in the books- Sugar Quills, Chocolate Frogs... you name it, they have it. I got myself a Chocolate Frog and I'm saving it for a Dementor attack... or a rainy day, whichever comes first. We also bought a cup of Butterbeer in the street and found it was delicious, although I'm pretty sure it's technically supposed to be served warm. The entire Harry Potter area was just awesome. Really, really awesome. I'm the biggest Harry Potter nerd in the world and I found nothing to complain about. A-plus-plus-plus. There was also an entire amusement park attached to The Wizarding World of Harry Potter. 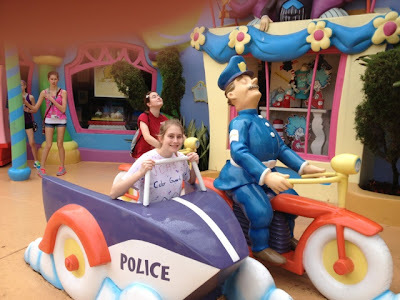 We hung out in Seuss Landing for a while (that's me posing like the policeman, my sister riding in the sidecar, and my dad accidentally getting his finger in the shot) and we decided it's cute and lovely, but mainly geared toward a younger audience. There was a lot to look at in Toon Lagoon (or whatever they call it), but they were mostly water rides and nobody was really in the mood for that. It was a rainy day. And I kind of enjoyed the Marvel Super Hero Island. I like superheroes like that. We only rode the Spider-Man ride, which was pretty fun. I have a bad history with the Incredible Hulk coaster and I didn't really feel like riding the Fear Fall thing. 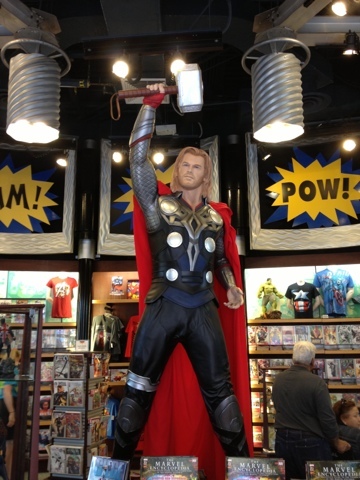 But I browsed through the comics and merchandise in one of the stores, and it was really cool to look at all the stuff. So there was this massive thunderstorm in Orlando and the surrounding areas today. Like, it was huge. Tornado warning, even. They'd been predicting it for weeks. 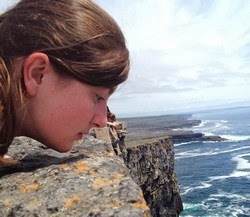 We kept an eye on the weather and tried to head out before it turned bad, but it caught us anyway. It was more than just a little awful. It was raining, but the wind was blowing so hard that the rain was going sideways in a wall of heavy mist. It didn't matter if you were under a roof or other shelter- you still got soaked. On top of that, there was very loud thunder and very bright lightning that struck very close to the park. People were running around and screaming. Like idiots. PSA: When thunderstorms happen in amusement parks, don't run around and scream. That's how people get trampled. Thank you. So we managed to wait out the heaviest of the rain (wrapped up in our cheap ponchos) and then we made our way to the car and got the heck outta there. But the entire time we were standing there and getting soaked by the sideways rain, I had half a mind to march straight back into the park and tell my new friend to knock it off with the scary weather. Universal is still not my favorite park (and not just because of the weather). I'd still take Disney over Universal any day. But Universal does have some fun things that people ought to do at least once. I really think that they need more things to do in the Islands of Adventure park (stuff that isn't shopping), but the rides and attractions that they do have are pretty fun. The Harry Potter area is definitely the best. So now it's time to hit the hay so I can have all kinds of blog-worthy adventures in the Magic Kingdom tomorrow. Until next time, mischief managed.